Georges Seurat (1859–1891), Poseuses (1886-8), oil on canvas, 200 x 249.9 cm, The Barnes Foundation, Philadelphia. Wikimedia Commons. In my recent article on complex narrative forms (‘continuous narrative’) in early painting, I remarked that such paintings became more unusual after 1500, with works becoming almost exclusively monoscenic, in depicting a single coherent moment in time. It occurred to me that – aside from the instances in the work of Burne-Jones – there is one notable nineteenth century painting which does not appear to be monoscenic: Georges Seurat’s Neo-Impressionist Poseuses (Models) (1886-8). However, this does not appear to have been examined, even in Michelle Foa’s recent superb monograph. This article therefore considers the pictorial structure of that painting. One of the first problems which I ran into, is that there are in fact two different versions of Poseuses: the full-sized version currently in The Barnes Foundation, Philadelphia, and a smaller version which Seurat painted in the same year that he completed that (1888), which used to be on display in the National Gallery, London, but has now returned to Berlin. 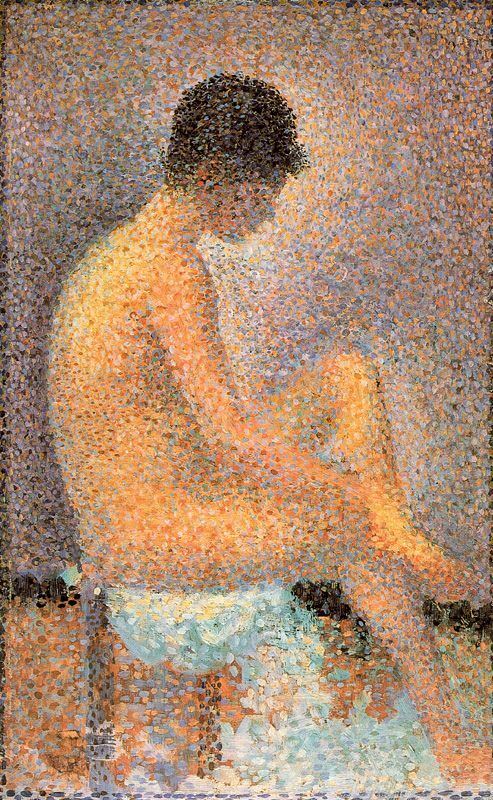 Georges Seurat (1859–1891), Poseuses (small) (1888), oil on canvas, 39.4 x 48.7 cm, Nationalgalerie, Berlin. WikiArt. The two can be told apart because the smaller version appears more obviously ‘granular’, whilst the larger appears far ‘smoother’ in the texture of its colour. Although the differences between the two versions appear small, for consistency I will here examine the full-sized version alone. Various preparatory drawings exist in different collections, but the three main figure studies made by Seurat for this painting are in the Musée d’Orsay, and confirm that the three figures in Poseuses were painted from the same model, were produced separately and then composited into the whole painting, and during that process two of the three were partially dressed, one with a white fabric wrap, the other with green stockings. Georges Seurat (1859–1891), Model from the Back (study for Poseuses) (1887), oil on wood, 24.4 x 15.7 cm, Musée d’Orsay, Paris. Wikimedia Commons. 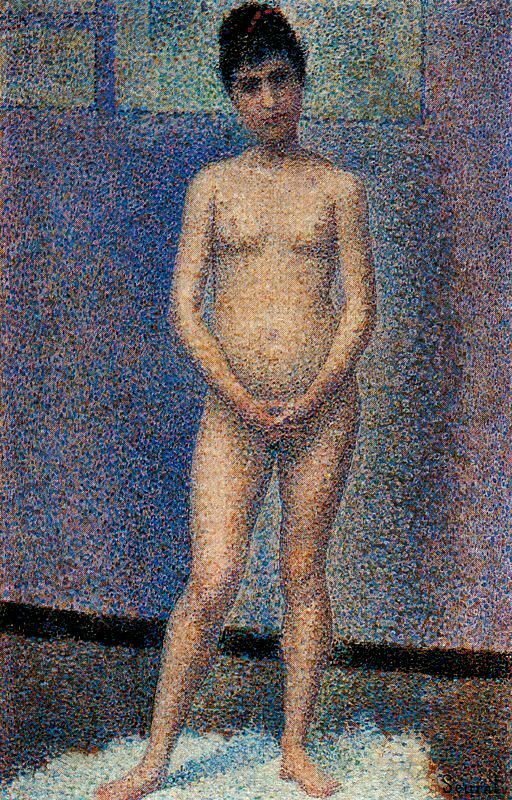 Georges Seurat (1859–1891), Model Standing (study for Poseuses) (1887), oil on wood, 26 x 17.2 cm, Musée d’Orsay, Paris. Wikimedia Commons. Georges Seurat (1859–1891), Model in Profile (study for Poseuses) (1887), oil on wood, 24 x 14.6 cm, Musée d’Orsay, Paris. Wikimedia Commons. Seurat shows three posed views of the same model, and makes it clear in her identical appearance that this is the same figure shown three times, and not intended to be one model pretending to be three different figures. To emphasise this, the same red ribbon appears in the hair of the central (standing) figure, and in the right (seated, donning stockings) figure. Sandro Botticelli (Alessandro di Mariano di Vanni Filipepi), Primavera (Spring) (detail) (c 1482), tempera on panel, 202 x 314 cm, Galleria degli Uffizi, Florence. Wikimedia Commons. 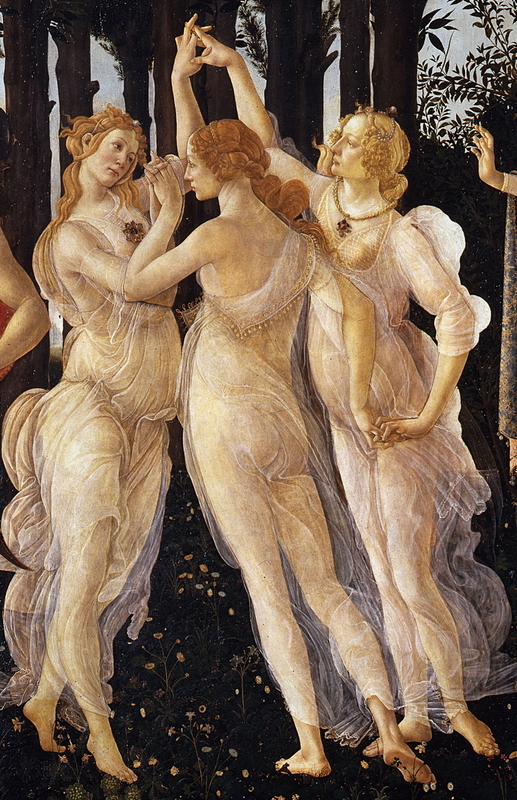 She has, therefore, little in common with popular depictions of the three Muses or Graces, such as in Botticelli’s famous Primavera (Spring) (c 1482). Such depictions go out of their way, using differences in hair colour, style, and personal adornments, to differentiate between the figures so as to assure the viewer that they are three different figures, even though they may have been painted from the same model. Muses/Graces and similar groups of women in paintings also usually interact with each other, linking hands or arms, often dancing. 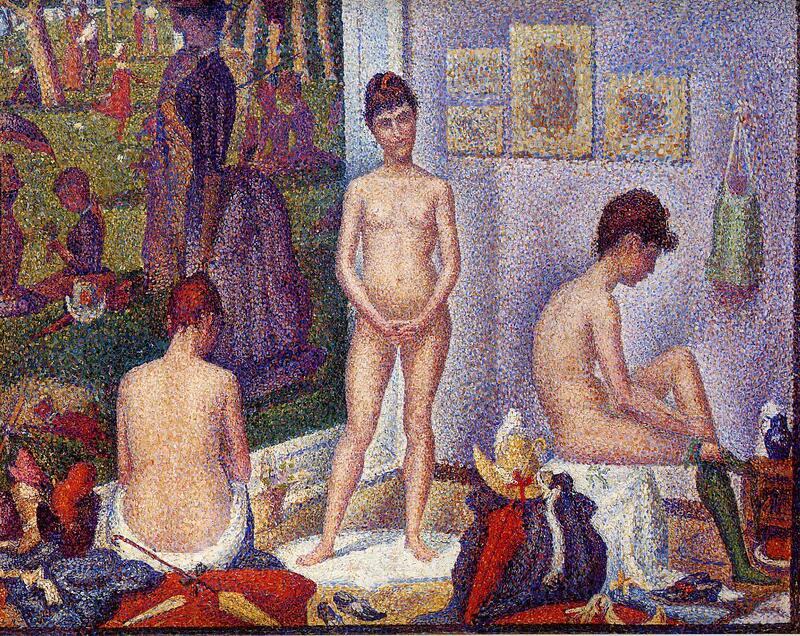 The pictorial evidence is that Seurat wanted us to see the same individual three times in the single pictorial space, and to recognise her as the same individual in each case. 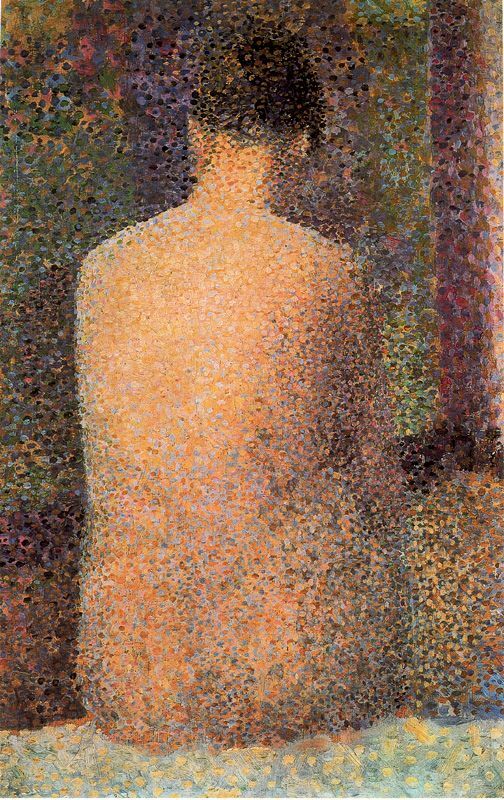 Georges Seurat (1859–1891), Poseuses (detail) (1886-8), oil on canvas, 200 x 249.9 cm, The Barnes Foundation, Philadelphia. Wikimedia Commons. a short green bodice, hanging from a nail or hook in the wall to the right of the rightmost painting. The only possible explanation is that these represent the collective possessions of the model from her three different appearances in the painting. Seurat has not just composited three different poses into the same pictorial space, but by accompanying each by the clothes and possessions brought on each of the three occasions, he is telling us that these are three different events, represented in the single pictorial space. Seurat started work on Poseuses when he had completed La Grande Jatte in 1886, which accounts for the presence of that large earlier work in this painting. Eadweard Muybridge was touring Europe from 1881 showing and lecturing about his multiple photographic images of horses and humans in motion, and it has been proposed that Seurat’s Le Chahut (The Can-Can) (1889-90) was influenced by Muybridge’s photographs. The three poses shown in Poseuses do not relate to any of Muybridge’s studies, but appear to be derived from technical drawing practice of three basic views of a 3D object. I also believe that careful study of Le Chahut reveals fundamental dissimilarities with Muybridge’s multiple images, notably that all the legs are in the same position, thus synchrony, not in motion sequence. Andrews explains that his term “continuous narrative generally refers to various methods of combining individual scenes, moments, or actions into a unified context of some kind, usually indicated by a frame or by other, similar means.” (p 120.) In the light of Seurat’s use of a single model, cues that the three figures are supposed to represent the same person, but clothing and possessions which indicate that these figures are seen on different occasions, there can be little doubt that Poseuses meets this loose definition. This exposes a potential weakness in Andrews’ term, as any narrative in Poseuses would appear to be very simple: reading from the left, the model arrives, undresses, and awaits instruction to pose; (centre) she poses; (right) when the artist has finished for the session, the model gets dressed again. Continuous narrative (or whatever you wish to call it) is an old and traditional feature of painting, which was progressively abandoned as styles became more rigorously realist. For Seurat to ‘quote’ the technique would have been a deliberate reference to early Renaissance and older painting. This would strengthen Foa’s case that Poseuses is “an extended and sophisticated exposition of the physiological grounds of vision”. In that La Grande Jatte contrasts with Poseuses in its deep spatial effect, against which the illegible flatness of the four smaller paintings makes further contrast. Georges Seurat underwent a classical art education, initially at a local École Municipale de Sculpture et Dessin in Paris, then at the École des Beaux-Arts. Throughout his lamentably brief career he seems to have valued Charles Blanc’s Grammaire des arts du dessin (1867), which adopts a thoroughly classical and history-based approach, although it does not itself include reproductions of any paintings which use ‘continuous narrative’. 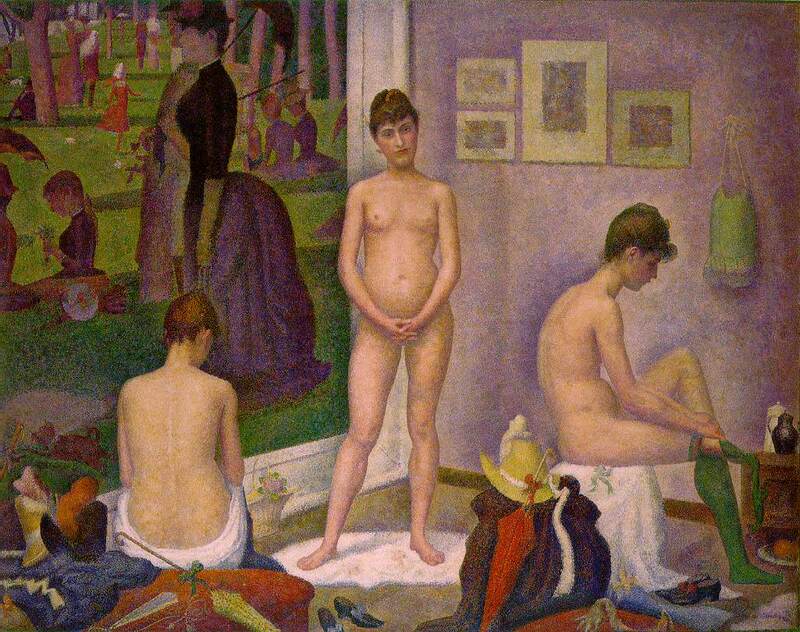 Critic Paul Adam praised Seurat’s use of “the pure line of the primitives”. It should therefore make good sense that Seurat chose to use a technique which incorporated three images of quite separate events into the single pictorial space of Poseuses, much as Masaccio had composited images from three sequential events into his single painting of The Tribute Money (1425-8) in the Brancacci Chapel. Posted in General, Painting and tagged Botticelli, Masaccio, Muses, narrative, painting, Poseuses, Seurat. Bookmark the permalink.